The Indian National Bar Association, in association with the Department of Commerce, Ministry of Commerce and Industry and the Centre for Trade and Investment Law, Indian Institute of Foreign Trade, is holding a Bar Leadership Summit on reforms in the Indian legal sector on Saturday, November 11, 2017. The full-day Summit will take place at SCOPE Convention Centre, CGO Complex, Lodhi Road, New Delhi. The occasion will be graced by Hon’ble Minister of Commerce and Industry, Shri Suresh Kumar Prabhu, Hon’ble Minister of State for Human Resources Development Shri Satyapal Singh, Shri Suresh Chandra, Secretary Law, Ministry of Law & Justice, senior officials from the Government of India and distinguished guests from the legal services sector. The leadership summit will explore the opportunities and challenges spawned by economic globalization that have dramatically reshaped the traditional sectors of the legal services such as arbitration and litigation. 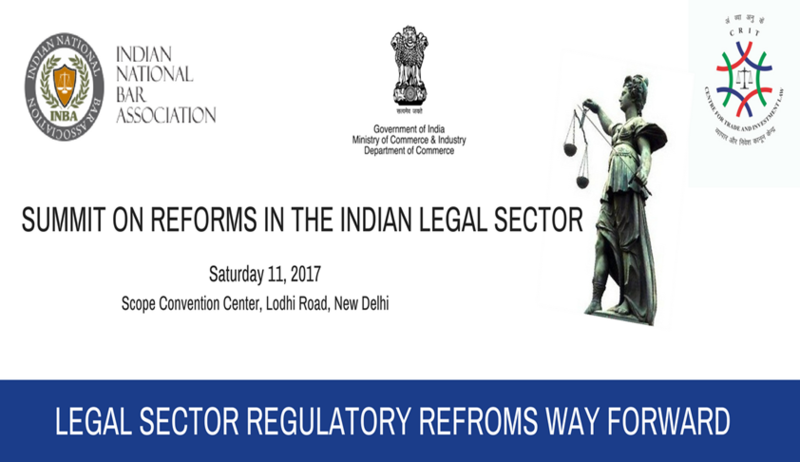 The event is expected to initiate comprehensive discussions and dialogue aimed at developing a roadmap for legal sector reforms in India. A key objective of the Summit is to seek views on transforming India into a hub for international arbitration and initiating the much-needed reforms necessitated by the increasing internationalization of the legal profession and allied services. India can become a hub for international arbitration and mediation services by ensuring meaningful domestic participation of foreign arbitrators in international commercial arbitration. It has been recognized that in order to achieve this objective, ‘institutional arbitration’ needs to be developed. Institutional arbitration can facilitate an improved business climate for domestic and international commercial transactions, and can contribute significantly to improving ease of doing business in India. The Summit is also an opportunity to consider liberalization of the legal services to enable foreign lawyers and foreign law firms to operate in a limited and regulated manner. An open and well-regulated legal profession is an enabler for foreign direct investment and facilitation of transnational business and investment. Recognition of the concept of foreign legal consultants (FLCs) is increasingly considered as a way of encouraging foreign participation in the legal services sector in a limited manner. Limited access for foreign law firms for practicing non-Indian law could help claw back a significant amount of work which is currently rendered from off-shore locations. However, reforms are needed for the overall growth and competitiveness of the legal services sector and for preparing a level playing field for Indian lawyers and law firms for harnessing the opportunities as well meeting the emerging challenges in this important services sector. The Summit aims to bring together a range of stakeholders from the legal sector in order to engage in a meaningful discourse and dialogue. To enable this, the Summit will feature technical sessions on areas like arbitration, domestic reforms and the multitudinous developments hastened by the processes of globalization and liberalization. Queries can be directed to Mr. Kaviraj Singh, Secretary General, Indian National Bar Association (9555572999) and Dr. James Nedumpara, Professor and Head, Centre for Trade and Investment Law (999727461). The Flyer for the Summit can be found here. For more details, click here.